An alcoholic is someone whose feet are firmly planted in thin air. You can always tell an alcoholic. But you can't tell him much. "The most important part of enlightenment is to lighten up," according to Bachom and Ross. Anyone who has ever felt humor's power to heal will second this saying -- and will find a wealth of wit to support it in this delightful book. A collection of quips and wise sayings, epigrams and home truths that have seen so many through troubled times and recovery. 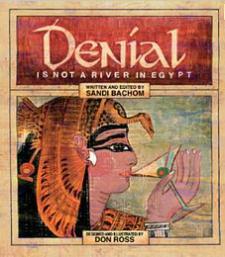 Denial is Not a River in Egypt delivers dose after dose of the best medicine. Embellished with whimsical hieroglyphics, these well-chosen quotations on fear, denial, insanity, ego, resentment, acceptance, healing and laughter can brighten our day in any stage of recovery. Sandi Bachom has worked as a freelance producer of television commercials for twenty-five years. She lives in New York City with her husband and son and has been in recovery for more than ten years. Don Ross is the coauthor and illustrator of a line of children's books. He lives in San Francisco and develops websites.